This is from my first series of HDR images. The light was afternoon harsh so I tried to bring it to life by using LR2 to make three separate two stop shots, combining them in Photomatix and running Tone Mapping. Processed it in PSE7 after that and enhanced green, yellow and blue, played with curves, CSM and a bit more. Not sure even now if it is a bit much as I normally do not process my stuff this much but I have received a good response from friends. I'm torn between this one and another of a reflection shot that I did HDR on and then ran through Silver Efex Pro. I'll post it after the challenge to see. All of these HDR images were done from one original processed three times. Thanks for the comments. I agree on the softening. I normally would have run this through Noise Ninja or Nik Define 2.0 a second time after processing which has the same effect. I just plain forgot in the last stages trying while trying to decide which to enter. I'm not sure it's overdone as you say--just a lot of yellow flowers making it look so, especially in the small size published here. Still, given a photo like this, I sometimes soften it to make it look more "natural". Very scenic. 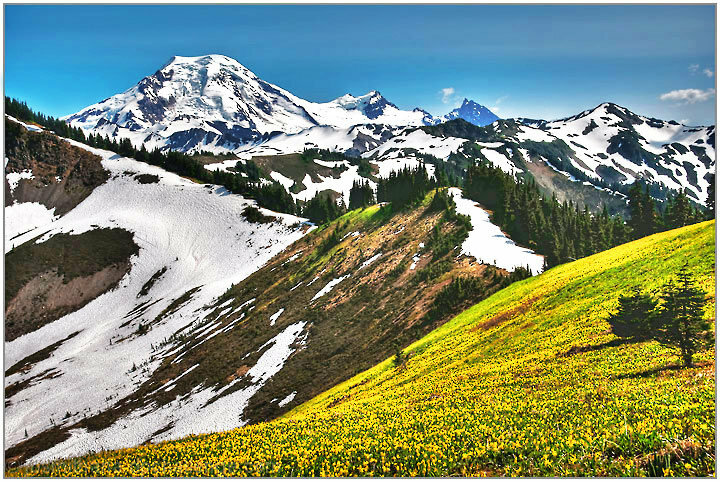 However on my screen, the yellow flowers and the mountain peak (upper left) looks just a touch over sharpened. Other than that, it's a great shot. Proudly hosted by Sargasso Networks. Current Server Time: 04/24/2019 11:51:02 AM EDT.